High School Flocknote Updates - Stay Connected! JOIN US ON SUNDAYS FROM 4:30 P.M.-8:30P.M. All high school students are welcomed to join us in the parish center for an evening of faith and fun! 4:30 P.M. Learn to Serve at Mass. Greet with Us at the Main Entrance! FOLLOWING MASS: Dinner, Discussion of a Catholic Topic, Sports, Adoration, and More ! Summer 2019 (various dates and locations): Camp Veritas. Life-transforming one-week play-and-pray sleep away summer camp for teens going into 7th to 12th grades. For more info, contact Clare, who also serves as the Camp Veritas Enrollment Coordinator. July 2019: St. Isaac Jogues Youth Conference. Held on the beautiful grounds of the Our Lady of Martyrs Shrine, the celebrations happen under a big white tent that we will fill with loud music, crazy fun and worship! 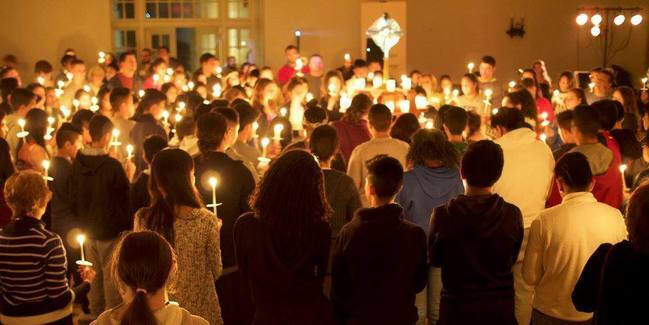 * If your teen is preparing for Confirmation in Spring 2020, these events will fulfill the retreat requirement. Camp Veritas: A dynamic, life-transforming Catholic summer camp for 7th-12th graders with locations in Newburgh, NY and Wurtsboro, NY. Volunteers (18+) attend for free. Check out this article and video from the Knights of Columbus on Ryan and Elizabeth Young, founders of Camp Veritas. Capital Region Frassati Chapter: Catholic young adults who meet weekly to pray and study the faith more deeply. High school seniors (18+) are welcomed to attend. Catholic News Service: This site reviews movies from both a moral & artistic perspective. Catholic Online: This site has ample information on Catholic saints. Saint Isaac Jogues Youth Conference: The Premier Catholic Youth Conference in the Northeast. Shrine of Our Lady of Martyrs: This is the place where Jesuit martyrs St. René de Goupil, St. Isaac Jogues and St. Jean de Lalande laid down their lives sharing the Gospel with the Mohawk Indians. St. Kateri was born there little more than 10 years after their deaths. Sunday, Sunday, Sunday Podcast: Be prepared! Listen to a reflection on the upcoming Sunday Mass readings with Mark Hart from LifeTeen. United States Conference of Catholic Bishops: The site features an online North American Bible, upcoming Mass readings/pronouciations (for lectors), and more! Word of Fire: A media apostolate with resources about the Catholic faith.